6. Departments of Radiology, Karolinska Institute, Stockholm and Uppsala University Hospital, Sweden. Favourable outcomes of peptide receptor radiotherapy (PRRT) of neuroendocrine tumours have been reported during the last years. Still, there are uncertainties on the radionuclides to be used, the treatment planning, and the indication in patients with a high proliferation rate. This case report describes a patient with a high tumour burden of poorly differentiated neuroendocrine carcinoma of unknown primary with a proliferation rate in liver metastases up to 50%, undergoing fractionated treatment with 7 cycles of 177Lu-DOTA-octreotate (7.4 GBq each) after disease progression on two different chemotherapy regiments. Based on initial staging scintigraphy, somatostatin receptor expression was very high. Longitudinal dosimetry studies during therapy indicated ongoing increases in tumour-to-organ ratios that coincided with an objective response. We conclude that fractionated therapy with 177Lu-DOTA-octreotate should be considered a treatment option also for those patients with large tumours, high proliferation, and high receptor expression. Keywords: Neuroendocrine tumour, PRRT, 177Lu-DOTA-octreotate, radionuclide therapy, dosimetry. During the last decade, encouraging reports from patients with neuroendocrine tumours undergoing targeted radionuclide therapy with somatostatin analogues (often referred to as peptide receptor radionuclide therapy, PRRT) have increased. The largest numbers of patients reported have been treated with 90Y-DOTATOC  and 177Lu-DOTA-octreotate [2, 3]. The results document the possibility of obtaining objective tumour responses in patients failing to respond to traditional biologic and cytotoxic chemotherapeutics. Radionuclide therapy targeting somatostatin receptors is the second of its kind to show objective tumour responses in a larger group of patients with solid tumours since the start of radioiodine treatment for thyroid carcinoma, only preceded by therapy with meta-iodobenzylbiguanidine (MIBG) [4-6]. Risk organs are kidneys and the bone marrow. Experience from radioiodine therapy  and external beam radiation  have been the reference points regarding therapy planning and dosimetry. However, there are important differences to be acknowledged. Unlike radioiodine treatment, some patients treated with PRRT can have extremely dramatic results. Also, exposure to significant amounts of 131I has been reported to impair uptake in consecutive treatments due to down-regulation of the sodium/iodide symporter [9, 10]. On the contrary, up-regulation of somatostatin receptors escaping from low-dose irradiation has been described in animal models . PRRT differs from external beam radiation because of the biological variables that influence radiation exposure. The radiation dose to the tumour as well as to normal organs is a function of the availability of the tracer, which is dependent on tumour size, receptor density and the amount and pharmacokinetic of the tracer. In other words, the physician planning PRRT cannot prescribe an absorbed tumour dose, but a certain amount of activity, that eventually results in a tumour or organ dose, depending on results of previous treatments and the patient's present general condition. Peptide receptor radionuclide therapy with somatostatin analogues is a new treatment modality with new inherent rules, which have to be explored. 177Lu-DOTA-octreotate is a suitable tracer both for treatment and imaging, emitting both a major fraction of beta particles for therapy, and a smaller fraction of gamma rays with good qualities for imaging. Continuous imaging and dosimetry of patients undergoing several cycles with 177Lu-DOTA-octreotate can provide important insights on the effects of previous cycles of therapy. Thus far, about 300 patients with different neuroendocrine tumours have been treated with 177Lu-DOTA-octreotate in our institution in close to 1200 cycles. By performing dosimetry of the kidneys, spleen, liver, and tumours with a previously described method based on 3-D imaging with small volumes of interest , some patients have revealed unexpected or unusual uptake and response patterns. The method is based on the repetitive measurement of the activity concentration in small volumes of 4 ml in areas with fairly homogeneous distributed uptake. Here, we report on the findings in a patient undergoing 7 cycles with 7.4 GBq of 177Lu-DOTA-octreotate each. A previously healthy 42-year-old woman presented with itching and abdominal discomfort in December 2008. In early 2009, she was diagnosed with poorly differentiated neuroendocrine carcinoma with disseminated disease in the liver, abdominal, thoracic and pelvic lymph nodes. Small bone metastases were suspected in the sacrum and the thoracic spine. The primary tumour was not found. Liver biopsies at two different time points from several liver metastases revealed a Ki-67 rate between 10 and 50%. Somatostatin receptor scintigraphy in March 2009 showed very high uptake in all known tumour lesions (Figure 1). Initial treatment commenced with cisplatinum and etoposide in April 2009. In September 2009, evaluation showed tumour progression and therapy was changed to a combination of temozolomide and capecitabine until response evaluation in February 2010 showed further disease progression. The tumour burden in the liver had grown abundant by this time, engaging more than 50% of the total volume with decreasing liver function (Figure 2) and chemotherapy was stopped. She was not a candidate for liver directed therapy. Since somatostatin receptor scintigraphy before start of chemotherapy had shown a very high expression of somatostatin receptors (grade 4), she was considered for treatment with 177Lu-DOTA-octreotate. By then, the glomerular filtration rate had decreased from already subnormal values (normal range, age adjusted >80 ml/min/1,73m2) at the time of diagnosis down to 41 ml/min/1,73m2 before the first cycle (Figure 2). Between May 2010 and August 2011, the patient received 7 cycles of 177Lu-DOTA-octreotate with an activity of 7.4 GBq each, after giving her written informed consent. During chemotherapy, the patient developed a pulmonary embolism and started treatment with fraxiparine. In September 2010, following the second cycle of 177Lu-DOTA-octreotate, she had a sudden drop in platelets, as part of a paramalignant phenomenon. She recovered after several weeks of prednisolone and fraxiparine; later cycles of PRRT were administered without any delay (Figure 3). In November 2011, the patient is in good general health without any tumour related symptoms. 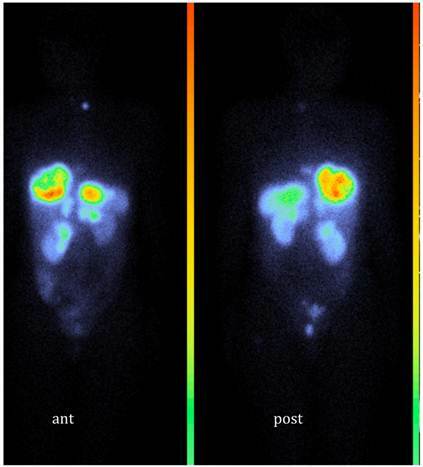 Somatostatin receptor scintigraphy (111In-DTPA-octreotide, OctreoScan®) in March 2009; Whole body scan, anterior and posterior view. 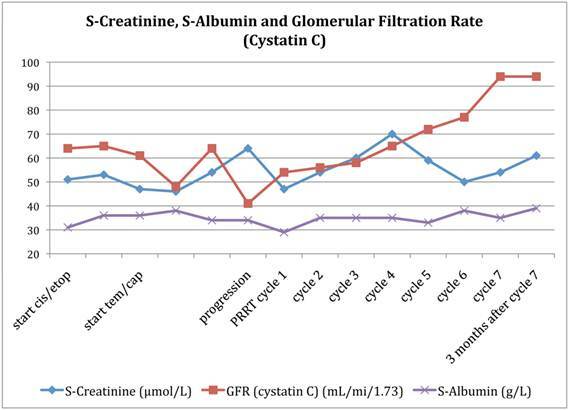 Glomerular filtration rate (GFR) according to the Cystatin C method, S-albumin and S-creatinine as a function of treatment. Blood cell counts during therapy with 177Lu-DOTA-octreotate. The DOTA-octreotate (Mallinckrodt, St Louis, MO) was a generous gift of Prof. Eric Krenning, Rotterdam, distributed by NRG, Petten, The Netherlands. 177LuCl3 was obtained from IDB, Petten, The Netherlands. Kidney protection was given with a commercially available mixed amino acid solution (Vamin 14g N/l electrolyte free, Fresenius Kabi, Sweden ®), 2 Litres at an infusion speed of 250mL/min were administered intravenously along with the first 5 cycles, 4 Litres with the last two, commencing 30 min before the radionuclide infusion. Seven cycles were given, aiming at an interval of 6 to 8 weeks. Full dosimetry as described earlier  was performed during cycles 1, 3 and 6, based on SPECT with low-dose CT for attenuation correction at 24 hrs, 4 and 7 days after therapy, whole body scan directly after the treatment and at the same time points as SPECT-CT as well as blood samples taken at 6 time points during the first 24hrs after treatment for calculation of a blood activity curve. Within kidneys, liver spleen and representative tumours, small volumes of interests (VOI) of 4 ml were drawn in areas with homogeneous activity distribution. During all other cycles, the uptake intensity in tumours and kidneys was calculated based on 24 hrs post therapy imaging with SPECT-CT and whole body scan, assuming the same effective half-life as calculated from the previous complete dosimetry . For dosimetry during cycle 1, the reported tumour VOI was drawn in areas representing the highest uptake within the respective metastasis. For the subsequent calculations the same areas within the tumours were identified. Imaging was performed on an Infinia (International General Electric, General Electric Health Systems, Haifa, Israel) dual headed camera with 3/8“ thick NaI (Tl)-crystals with VPC-5 (MEGP) collimators. Bone marrow dosimetry was based on a) calculation of the self-dose derived from the blood and b) calculation of the dose contribution from the rest of the body, including tumour, based on whole body scans. The detailed description of the calculation is subject of a forthcoming report. Response control was performed on contrast enhanced CT according to RECIST 1.1  criteria after cycle 2, 4 and three months after cycle 7. Figure 4 demonstrates the growth of the largest metastasis in the liver representing the main total tumour burden, measured according to RECIST in contrast enhanced CT images. Combined chemotherapy managed to decrease only slightly the diameter of a pelvic tumour, while all other metastases continued to grow in size. After the initiation of PRRT, all metastases decreased on treatment with 177Lu-DOTA-octreotate and continued to do so at subsequent times of evaluation. Three months after cycle 7, all liver metastases showed radiological signs of necrosis. The sum of the tumour diameters decreased by 44% according to RECIST since the start of PRRT, corresponding to a partial remission. Also according to the scintigraphy acquired during each cycle, the total tumour burden continued to decrease throughout the whole therapy (Figure 5, whole body scans at 24 hrs after infusion, cycle 1 to 7; upper row anterior views, lower row posterior views). 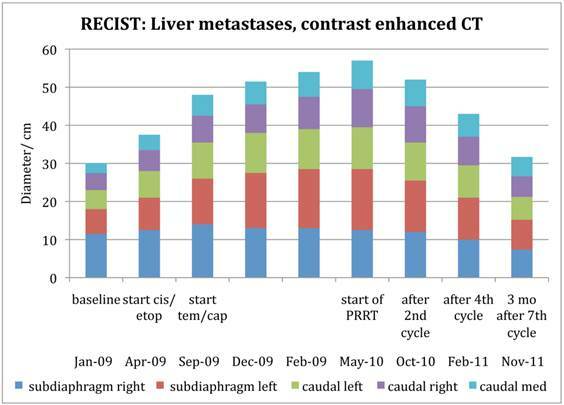 Figure 6 illustrates the volume reduction of the liver along with the tumour burden on sagittal views at start of PRRT and during the final treatment cycle. The right kidney, dislocated at start of PRRT, had returned back to its normal anatomical place by cycle 7 (arrow). Whole Body Scan 24 hrs after treatment. Upper row anterior view, lower row corresponding posterior view. Sagittal views of SPECT-CT over the abdomen at the level of the right kidney, 24 hrs after infusion of 7.4 GBq of 177Lu-DOTA-octreotate. a) Cycle 1, May 2010 b) cycle 7, August 2011. Left upper corner in each image: attenuation correction CT, right upper corner attenuation corrected SPECT, left lower corner fused SPECT-CT, right lower corner maximum intensity projection (MIP). Note the position of the right kidney (arrow) and tracer distribution within the tumours. After seven cycles of 177Lu-DOTA-octreotate with 7.4 GBq each, dosimetry according to the previously described small VOI method   indicated an accumulated absorbed dose to the right kidney of 25.4 Gy and 24.4 Gy to the left kidney. The absorbed doses to the kidneys remained essentially on the same level during the first 4 cycles, but increased towards the end of the treatment (Figure 7). The dose to the spleen decreased slightly. The absorbed dose do the bone marrow decreased throughout the treatment, both the self-dose calculated from the blood activity (89, 75, 60 mGy at cycle 1, 3 and 6), as well as the photon contribution from solid organs, tumours and the remainder of the body (121, 106, 78 mGy, respectively). Applying the same method as previously described for solid organs to the tumours , all measured tumours increased their activity concentration and, as a consequence, the absorbed dose throughout the course of therapy. Figure 7, 8 and 9 show the calculated doses for the largest metastases in the liver, one in each lobe, at cycle 1, 3 and 6. The areas that were chosen represented the highest uptake at cycle 1. The activity distribution grows more homogeneous during the treatment, while the tumour appears to shrink concentrically according to the fused SPECT-CT images. This implies an even more pronounced increase of uptake in tumour areas outside those areas that are shown here. The more homogeneous activity distribution in the remainder of the large liver metastases is obvious in Figure 6. Figure 1 illustrates the development of kidney function expressed by creatinine and the glomerular filtration rate (GFR) according to the cystatin C method. Meanwhile creatinine levels throughout the whole treatment were within normal ranges; the GFR decreased further during chemotherapy from already abnormal values. After the start of 177Lu-DOTA-octreotate, the GFR consecutively increased to a normal level (> 80ml/min/1.73 m2) by the time of the last cycle and remained there at the time of first post-treatment evaluation. During the initial phase of therapy, the patient suffered from repetitive lung embolism and, after cycle 2 of 177Lu-DOTA-octreotate, of a sudden drop of platelets. This was assessed to represent a paramalignant phenomenon, rather than radiation induced. 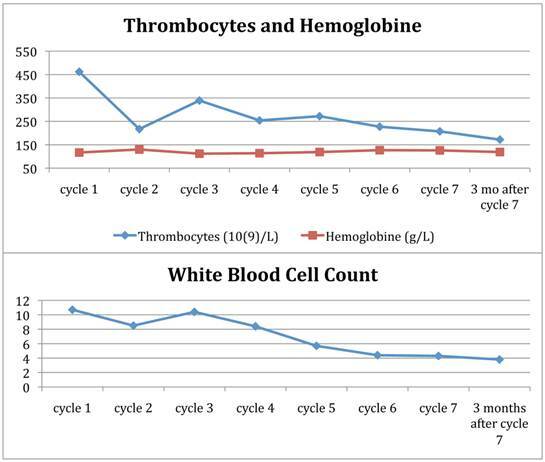 After treatment with prednisolone and fraxiparine, the patient recovered to good health, and platelets as well as total white blood cell counts and hemoglobine remained within normal ranges throughout the further treatment (Figure 3). Absorbed doses to kidneys, liver parenchyma, spleen and the two largest liver metastases, one for each lobe. Data from complete dosimetry at cycle 1 (May 2010) cycle 3 (October 2010) and cycle 6 (April 2011). Absorbed doses are calculated from SPECT-CT data according to the previously published method, using small volumes of interest (VOI) . Note the increase of tumour doses during therapy. At first cycle, the area of measurement was placed in the hot spot of either metastasis; in latter cycles, corresponding areas were identified and evaluated. 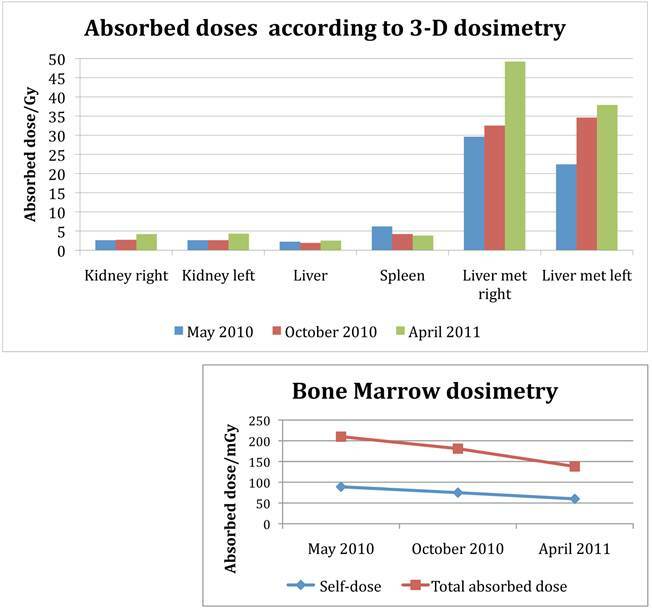 Bone marrow dosimetry: Self-dose calculated from blood-activity curve, total absorbed dose in the bone marrow calculated from cross-fire dose and self-dose. SPECT-CT images (left) and corresponding diagnostic CT (right) of largest liver metastasis in the right liver lobe at time of dosimetry at cycle 1, 3 and 6 (top to bottom). SPECT-CT images: left upper corner attenuation correction CT, right upper corner attenuation corrected SPECT, left lower corner fused SPECT-CT (all transversal views), right lower corner maximum intensity projection (MIP). Note the concentric shrinkage of the tumour and the increasing homogeneity of the uptake distribution. 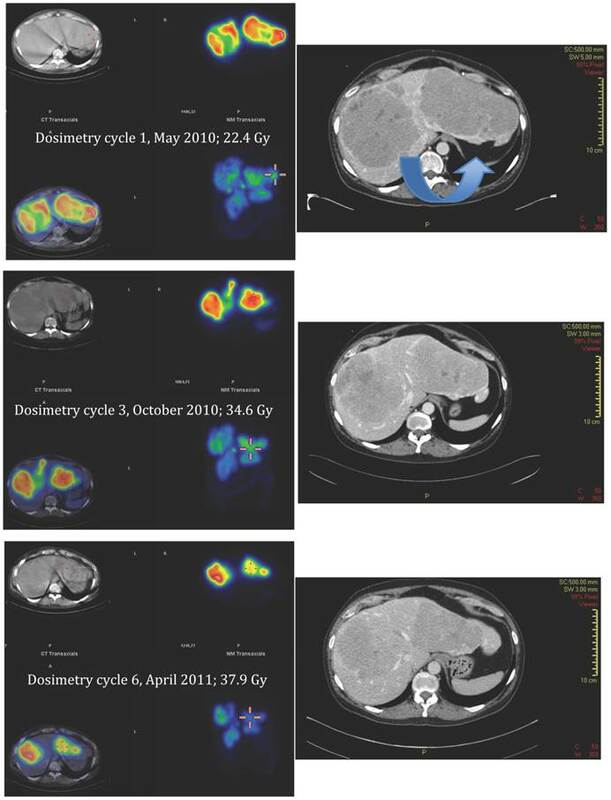 SPECT-CT images (left) and corresponding diagnostic CT (right) of largest liver metastasis in the left liver lobe at time of dosimetry at cycle 1, 3 and 6 (top to bottom). SPECT-CT images: left upper corner attenuation correction CT, right upper corner attenuation corrected SPECT, left lower corner fused SPECT-CT (all transversal views), right lower corner maximum intensity projection (MIP). Note the concentric shrinkage of the tumour and the increasing homogeneity of the uptake distribution. There are several lessons to be learned from this patient's history. Molecular imaging, especially with 18FDG-PET, has taught us that decrease of uptake is mirroring decrease of tumour activity. Previous observations of patients undergoing PRRT with 177Lu-DOTA-octreotate have shown a correlation of decrease in uptake and patient outcome . In this patient's example, a very high pre-treatment uptake was combined with a large tumour burden. The increase of uptake, and as a result, the absorbed dose to the tumours occurred simultaneously with an objective decrease of tumour burden assessed by RECIST criteria, in agreement with findings on scintigraphy. This suggests, that at least in part, the increase of uptake is due to an increased availability of tracer as a result of a decrease of the total number of receptors. In a patient with an amount of tumour receptors vastly exceeding the amount of available tracer, this phenomenon might occur until the tumour volume has decreased and the total amount of tumour receptors is lower than the amount of available tracer. Tumour response may also be accompanied with an increased absorption of necrotic tumour cells acting as “spacers” between cells with receptor uptake, which in turn can improve absorbed doses through an increase of cross-fire. There are additional and contributory explanations. Receptor up-regulation in tumour cells surviving low dose radiation is one possible explanation, and has been discussed based on results in a rodent model. Without the ability to quantify the total amount of receptors before and after treatment, this concept remains hard to prove in patient treatment. Quantitative PET imaging may help to solve this. This approach must take into account the possibility, that the total amount of receptors in a patient might not be saturated by a tracer dose. This has a direct impact, if the results of PET imaging are going to be used for future therapy planning for PRRT. Another contributing factor of increased tumour uptake during PRRT is the possible accumulation of the radionuclide after previous cycles of treatments, especially in tumours with high tumour uptake. In other patients, we have been able to detect activity in tumour as long as several months after a treatment cycle. The described patient showed before the start of PRRT a steady increase of tumour burden along with decrease of glomerular filtration rate, calculated from cystatin C. Nevertheless, creatinine remained basically unchanged throughout the whole treatment, and urea decreased from levels in the upper normal range to the lower, with highest values during chemotherapy (data not shown). Cystatin C has been reported to be a valuable marker of kidney function for patients undergoing chemotherapy . However, Kos et al reports on increased Cystatin C levels in patients with colorectal cancers and malignant melanoma  as a possible source of underestimation of the kidney function in patients with these types of malignancy. The findings in this patient may indicate, that the tumour secrets Cystatin C leading to an underestimation of the kidney function, given the fact that urea and creatinine remained within the normal range. It is interesting though, that an improvement of the calculated GFR occurred during PRRT, a phenomenon we have encountered in several patients. Thus, the kidney function in neuroendocrine cancers should not be deemed from only one functional test, since false low results can prevent treatment in patients with potential gain from PRRT. Adequate kidney function is an important prerequisite for PRRT, and several authors have reported on impairment of kidney function after PRRT [1, 17, 18]. Esser et al compared the residence time in tumours, kidneys and spleen for 177Lu-DOTA-octreotate and 177Lu-DOTATOC in 7 patients and concluded that 177Lu-DOTA-octreotate had about 1.5 times longer residence time in tumours as compared to the kidneys . Increased residence time in the tumour compared to the kidney is especially advantageous for isotopes with a longer half-life. Reubi et al  discussed the impact of the introduction of different chelators and of radiometals on the affinity of a somatostatin analogue, finding a ninefold increase in affinity for receptor type 2 when comparing [DOTA0, Tyr3] octreotate and [DOTA0, Tyr3] octreotide. Kwekkeboom et al found three- to fourfold higher uptake in 4 out of 5 tumours with basically unchanged uptake in kidneys and spleen, when comparing patients treated with [177Lu-DOTA0Tyr3] octreotate and [111In-DTPA0] octreotide . Optimal tumour-over-kidney uptake is crucial for an optimal treatment result. Taking into account the shorter tissue penetration range of 177Lu as compared to 90Y, the same group draws the conclusion that 177Lu-DOTA-octreotate is the radiolabeled somatostatin analogue of choice for PRRT . This patient's example supports in our opinion this view and adds another aspect. This is to our knowledge the first time that an increase of tumour-to-kidney and tumour-to-bone marrow dose is reported in a patient undergoing fractionated therapy with 177Lu-DOTA-octreotate. This demonstrates the possible advantage of a fractioned therapy approach, with improved tumour-to-risk organ dose as a result of previous treatment cycles. The amount of activity administered in this patient would not have been possible with a 90Y labelled compound, neither the described approach of dosimetry. Fractionated therapy seems to be especially important in large lesions with high uptake, when the follow-up scans indicate an improved, more homogeneous distribution pattern. This leads to the next conclusion to be drawn from this patient's example. The observation in our present patient of an improved tumour-to-organ dose ratio as a function of previous cycles of therapy adds a new aspect to the discussion. 177Lu has in comparison to 90Y a shorter range in tissue and offers the advantage of lower irradiation of structures adjacent to the tumours. Repeated cycles of 177Lu-DOTA-octreotate may lead to improved tumour dose absorption doses at the cost of comparatively low kidney toxicity, if scanning and dosimetry under therapy shows an improved, more homogeneous uptake pattern in the tumour. Under these circumstances, also the longer half-life of 177Lu is an advantage, since the ratio of tumour-to non-tumour irradiation improves over time. Thus, very high, and potentially tumoricidal accumulated absorbed doses can be achieved (Figure 7). In our experience, this pattern is especially common in hindgut tumours with a large tumour burden (data in preparation). The potential for fractionated PRRT treatment in patients with high tumour burden, using surveillance dosimetry should be the subject of further evaluation. A recent report on the comparison between PRRT with 90Y-DOTATATE and 90Y/177Lu-DOTATE indicates a survival advantage for the combination therapy . Our reported findings suggest that a dosimetry-based approach with 177Lu-DOTA-octreotate might be advantageous over 90Y-labeled somatostatin analogues and possibly even combination therapy, and should be regarded as a veritable contestant for a randomized study, as suggested by Brans et al. in a reply to this article . The described case highlights still one other aspect of the discussion interesting clinicians involved in the treatment of patients with neuroendocrine tumours. The ENETS clinical guidelines for the treatment of poorly differentiated neuroendocrine tumours with high proliferation rate recommend cisplatinum-based chemotherapy as first line treatment [30-32], yielding an objective response rate of 60 to 70%, with a duration of 8 to 9 months. High proliferation is generally regarded as an indicator of low somatostatin receptor expression, and somatostatin scintigraphy is not regularly performed for this reason . The very high uptake in the pre-therapeutic somatostatin scintigraphy was in favour of our patient. Only recently, a report focusing on the results of PRRT with 177Lu-DOTA-octreotate in 81 patients with respect to proliferation rate found comparable outcome in patients with proliferation rates up to 20%, with partial responses in 40%, minor responses in 15% and stable disease in another 34%, with 11% in progressive disease . Only 2 out of 7 patients with a proliferation rate over 20% responded to the treatment that had been given in four cycles with a mean activity of 7.9 GBq at standard intervals of 3 months (10-14 weeks). In accordance with previous reports , a positive correlation of uptake intensity and outcome was found. Also in this setting, the patient we report on is a unique case, with a high proliferative tumour that has responded favourably to PRRT with 177Lu-DOTA-octreotate. Tumours with high proliferation tend to have a quick tumour recovery, and the time elapsed between treatment cycles is of significance. In our opinion, if considering PRRT in the case of highly proliferative tumours, treatment intervals should be kept as short as possible, side effects such as bone marrow suppression taken into account. The example of our patient is a proof of concept that treatment with 177Lu-DOTA-octreotate can be effective for patients with a proliferation rate over 20%, given a high receptor density. Also in this group of patients, the presence of somatostatin receptors should be evaluated. 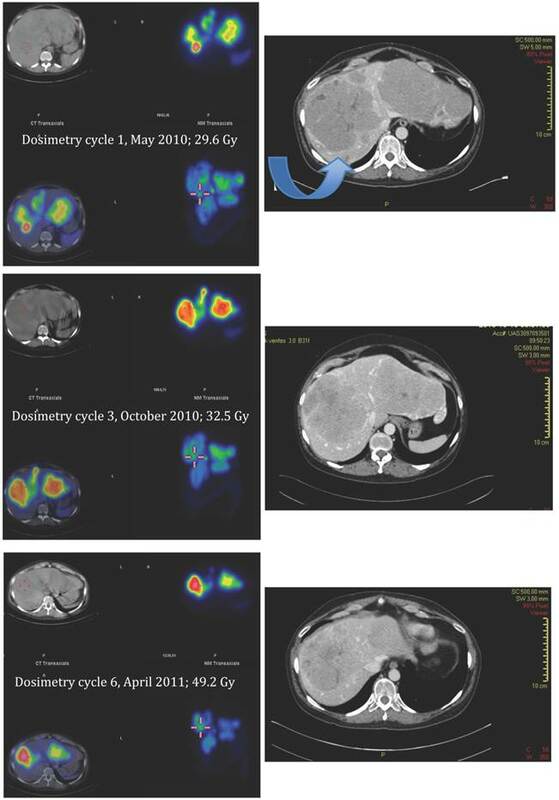 The reported patient illustrates that fractionated therapy with 177Lu-DOTA-octreotate based on dosimetry can improve the tumour-to-tissue dose due to increased tumour uptake as a result of previous treatment cycles. Tumoricidal absorbed radiation doses can be achieved despite large tumours and high proliferation rate. Imaging and dosimetry during therapy is a valuable tool for treatment planning and for the evaluation of the outcome. The authors would like to thank Prof. Eric Krenning for the generous peptide supply. With gratitude we acknowledge Assistant Prof. Eric Liu for his linguistic help. We also would like to thank our patient for giving her consent to publish the provided images and data. Corresponding author: Ulrike Garske MD. Phone +46-(0)18-611 5508 Email ulrike.garskese.